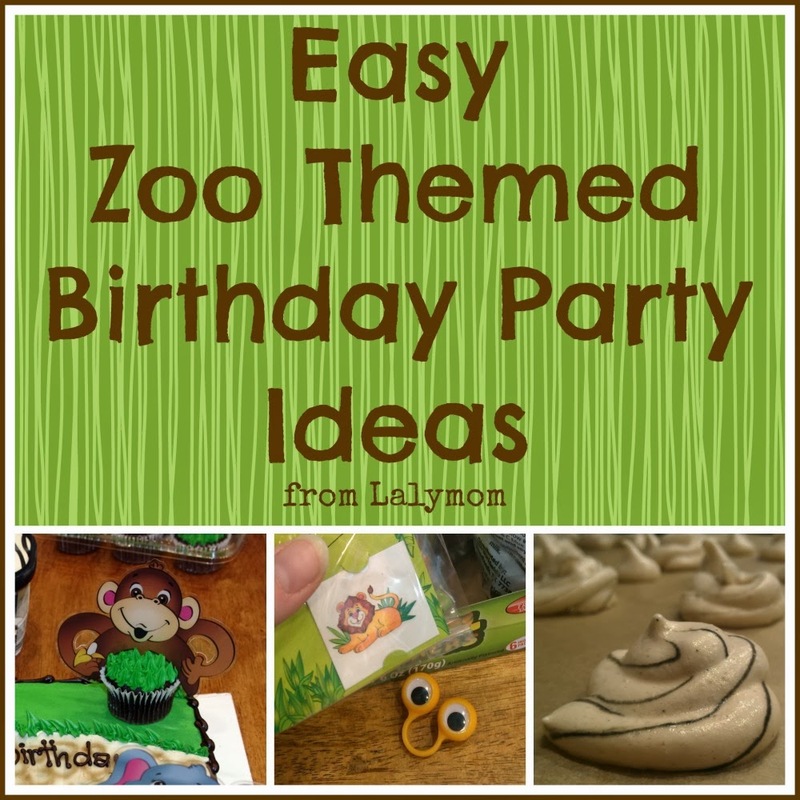 Inside: Find tons of awesome Zoo Birthday Party Ideas that are as fun as they are easy! This post was originally published in 2013 but I've updated it for 2018! 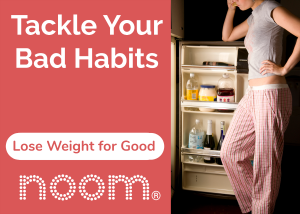 Affiliate links are included. Little Big Man turned one in September and I was looking for a fun but low-prep theme for the birthday party. My cousin gave us a cute First Birthday bodysuit that had a few animals on it so I thought I'd run with that and go for a zoo theme birthday party. These ideas could also be used for a safari themed birthday party or jungle themed birthday party and could be easily done for any young kids, not just a first birthday. Here is what we did for games & activities, food and party favors. I cannot find the exact bodysuit online but there are tons out there, here are some from CafePress. Once I chose the theme, everything was pretty easy- just the way I like it! I loooove these adorable Walking Animal Balloons and think they could do double duty: party decor AND party favors! There is also this animal themed birthday pack that comes with latex balloons, mylar balloons as well as cupcake picks. We have never been too big on organized games at the parties in my family but I wanted to have some fun things for the kids to do if I caught wind of boredom. An idea from our family holiday party was to hang a large sheet of paper on the wall with crayons and markers so the kids could make a mural. We added the zoo theme by writing Welcome to the Zoo! across the top and letting the kids make their own animals using these zoo animal sticker sets from Oriental Trading Company. Amazon also has these animal sticker sets. 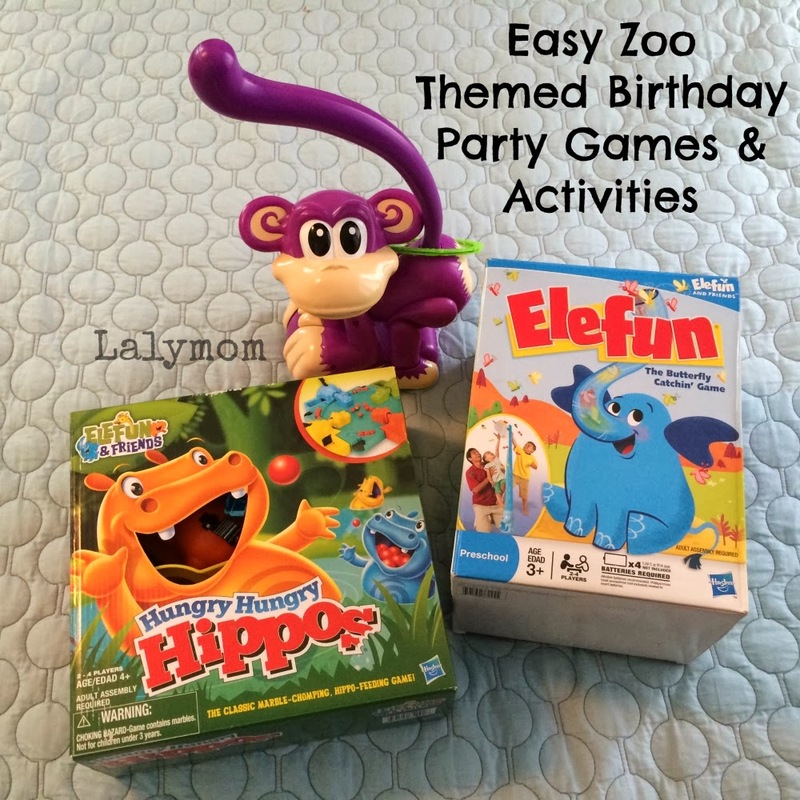 We also had on hand Hungry Hungry Hippos, Elefun and Chasin' Cheeky Monkey games for the kids to play. These games can get kind of rowdy and loud but we had them already and sometimes you need a little “loud and rowdy” at a party! If you are into organized games with prizes, clearly you could give prizes for the winners of these games and they fit pretty well with the party theme. The last little thing we had were these cool Zoo Animal Hand Puppet Tattoos, also from Oriental Trading Company. You have to trim off the extra pieces at the bottom to apply and the kids have to get their hands just right. I put them on all at once, not one leg at a time and it was pretty easy. They came out pretty cute! The kids had fun playing zoo and jungle out in the back yard, the “animals” loved playing on the swing set and I do believe there were some animal races going on! Have the kids made their own zoo with zoo animal figurines. Try your hand at some Animal Origami with these pre-printed sheets. The kids would love to make some Foam Animal Masks with these kits. Put on a puppet show with some cute, affordable Animal finger puppets. So we had the fun ideas planned, now it's time for the food. I wanted to make “something” for the party but it needed to be done ahead of time, during nap time and for the sake of everyone involved, it needed to be easy! Enter the meringue! 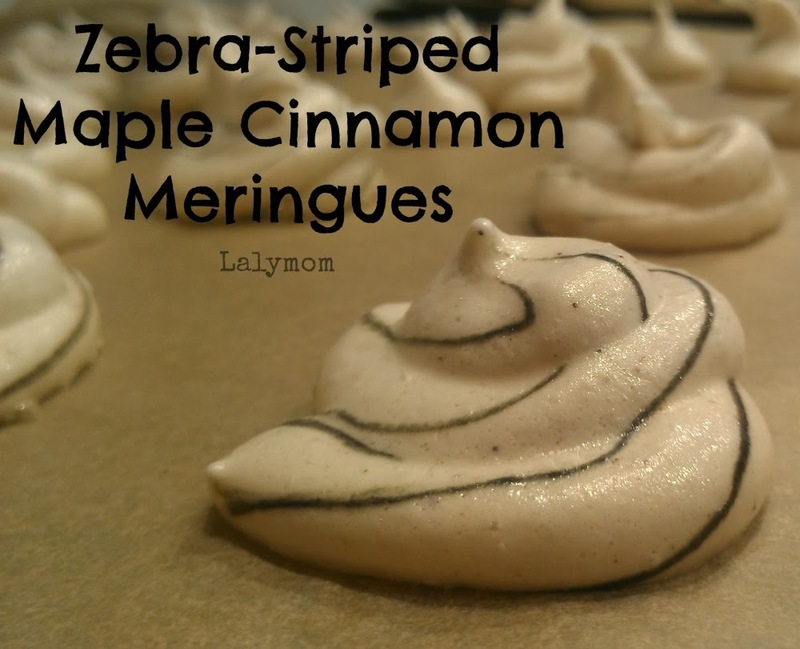 I tinkered around with a couple different meringue recipes in the past and thought I would try making some orange-vanilla tiger striped meringues and maple cinnamon zebra-striped meringues. The tiger stripe ones were based on this Martha Stewart recipe but I added orange gel food coloring to the meringue and was going to add black stripes to the pastry bag. Turns out I added too MUCH orange gel food coloring, however! They totally fell and I did not even bother piping them out. I scrapped the food coloring and just went for the stripes. I had some maple extract to use for the second batch but in the process of researching the recipe I found this recipe at Gourmande in the Kitchen that uses actual maple syrup instead of white refined sugar, which I thought was brilliant. I also should note that I skipped the egg cracking and separating by buying a carton of 100% egg whites at the store. Even easier- yay! The Martha Stewart recipe tells you to use a paint brush to paint the gel food coloring into your pastry bag in order to give the meringues the swirl stripes. Well I used a ziploc baggie instead of a pastry bag and the painted gel food coloring lines did not last. What I found worked best was squirting in thick lines of the gel directly from the tube. I used Wilton's Black Sparkle Food Gel for this. The first few were very black but soon it evened out and then they all came out like the one in the picture. They tasted AWESOME, if I do say so myself! All kudos go to the original recipe author though, not me! The other food items we had were purchased. We had catering from Chipotle, which was a huge hit! People were actually taking pictures of it to send to their significant others who were unable to attend. We would use them again for sure. They had everything packed in nice strong reusable bags, including stands and sterno heaters to keep the hot food hot. They included the bowls that you get your food in at the restaurant, utensils for everyone, washable serving utensils, food name tags, napkins, condiments- everything! It was all there! We had a small amount of leftovers, which is exaaactly what we were hoping for! 😉 Next it was time for dessert! We had Zebra striped ice cream from my favorite grocery store- Mariano's- and we also ordered the cake and cupcakes from there too. You could easily make this all yourself if you are the cake baking type but I wanted to keep it easy so we ordered them. With a little detailed description to the bakery department, and a little added bling at home. We ended up with a fun and easy zoo birthday cake! I ordered a half sheet cake and described that I wanted it to look like the walkway of a zoo and told them I was going to add a cupcake on each corner with the animals. I also ordered chocolate cupcakes with green frosting to look like grass. 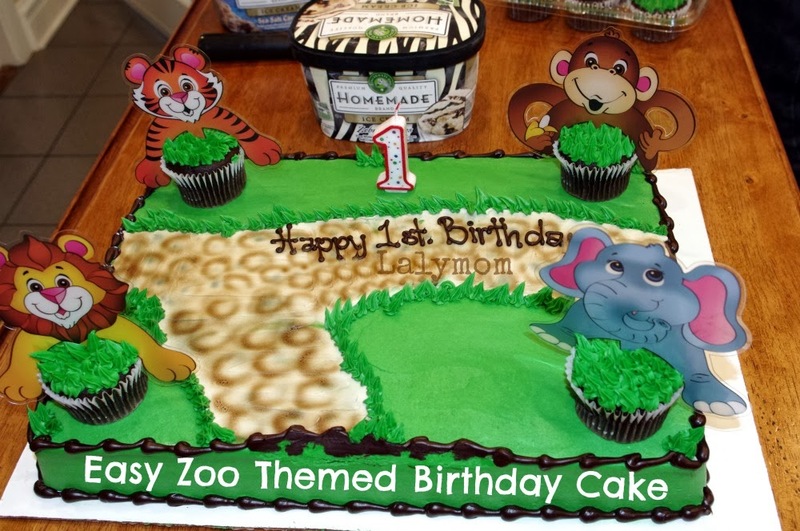 I added these fun Zoo Animal Cupcake Pics and that was that! I have also seen cupcakes with animal crackers stuck in the top, which would also be an easy option. CAKE DECOR OPTION: Instead of the cupcake picks you could also use these ADORABLE animal shaped birthday candles as the animals in the zoo. Oh my gosh. Cuteness! The last zoo themed item we had was the party favors. 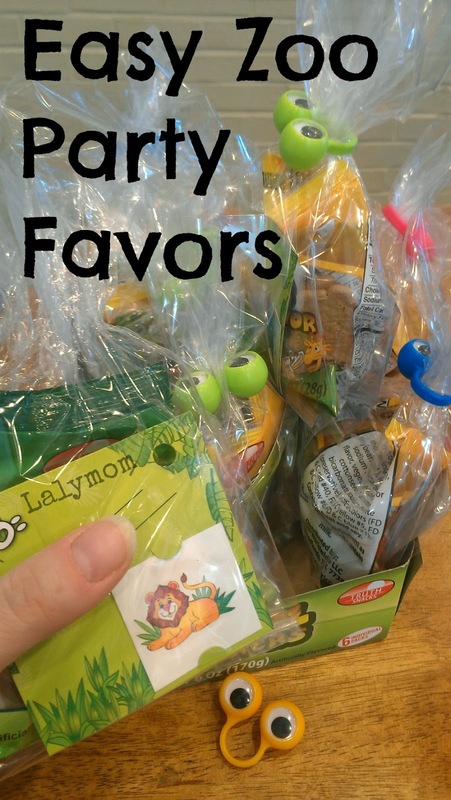 For these we used basic clear cellophane treat bags, single serving bags of animal crackers, Zoo Animal Tattoos on Cards for the name tags and closed the bags with these googlie eye rings that make your hand into a puppet (found those on an end cap at Michael's). There are tons of easy little things you could put in these if you can't find these items. Animal print ribbon or animal washi tape could be used to close the bags, you could make your own animal name cards, you could add a mixture of goldfish, gummi bears and other animal themed snacks, etc. All in all, I think it was a pretty fun birthday party for my little guy and it wasn't too hard to put together! If you are looking for more birthday ideas please follow my Kids Party board on Pinterest. 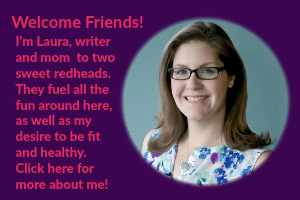 Also go ahead and click that ole' like button at the top right of my blog to follow along with all our fun on Facebook! Hope to see you again soon! 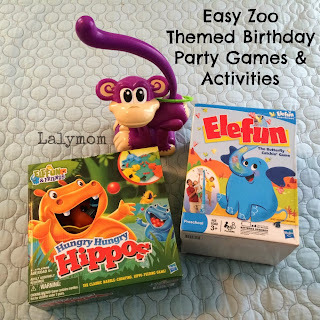 Have fun with your Zoo birthday party! 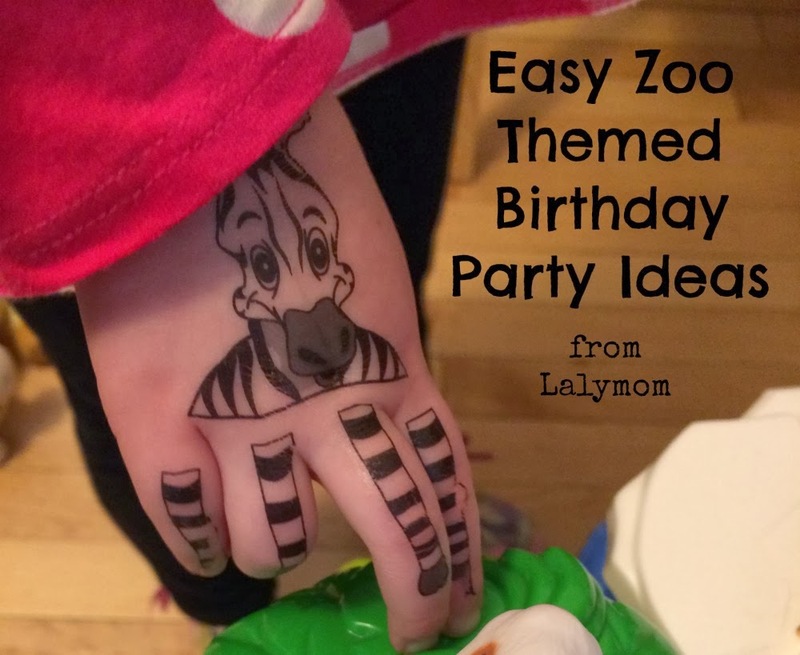 Share any zoo party ideas you had in the comments below! I WANT ZEBRA STRIPED ICE CREAM. NOW! Ahem. Sorry. Looks like you had a great party! Aww yay!! Happy Birthday bday buddy! 🙂 What a fun party filled with adorable ideas! Those hand tattoos are really awesome and the meringues look delish! Cute cake too! I bet he had a blast! I must admit that the zebra stripped meringues looked like little animal poos and I couldn’t help laughing because they fit the theme so well. Then I saw them in the second picture and I could see they were really zebra striped. I had to have a giggle. Either way they really are too cute and you’re very clever!